Who Took Over Dr. Baker's Dental Practice? John Baker: "Operator for the Teeth"
Where Did the Fifth Regiment Live? Adolescent Rebellion in Colonial America? Mather Byles, Sr., and "three thousand tyrants"
Begs Leave to take this Method of informing the Public, That he shall leave this Place in twenty Days at farthest.—That those who are disposed to apply to him may not be disappointed. He also begs Leave to express his Gratitude for the Favours he has received while in Boston; and hopes that those who doubted of the Safety of his Art, from its Novelty in this Country, are now convinced of its Safety and Usefulness. Until he leaves his Town he continues at Mr. Joshua Brackett’s in School-Street; where he will be ready to contribute to the utmost of his Power to serve the Publick in his Profession. 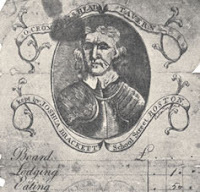 Brackett was proprietor of an upscale tavern and inn known as the Cromwell’s Head because its sign featured a portrait of the late Protector (as did its billhead, shown above). Most of the British Empire then saw Cromwell as a dictator, a warning against both popular power and religious enthusiasm, but Boston, with its Puritan heritage, still admired him. Baker originally called himself an “Operator for the Teeth,” an older name for his profession. His next three newspaper ads all use the label “Surgeon Dentis,” so I don’t think the second word was a typo. In fact, before Baker’s arrival, the word “dentist” seems to have appeared in Boston newspapers only once, in a reprint of a 1766 essay from New York. Other practitioners arriving in America from Europe used “Surgeon Dentist,” however, and later in 1767 Baker adopted that label permanently. So the vocation seems still to have been defining itself. On 5 May 1768, “John Baker, Surgeon Dentist,” announced his arrival in New York, “at Mr. John Watson’s, in the house wherein Capt. Randall lately lived, at the corner of Pearl-street.” By this time, he claimed to have “given sufficient proof of his superior judgment in this art...to upwards of two thousand persons in the town of Boston.” Then in July, Baker announced he was leaving after one more month. Travel seems to have been a professional necessity in those centuries before the six-month check-up. Baker next surfaces in Williamsburg, Virginia, in early 1772. And there his clientele included... Well, which colonial Virginian is most famous for his dental difficulties? Yes, in April 1772 Dr. Baker removed several troublesome teeth from the mouth of planter George Washington. On 13 Oct 1773, Washington noted in his diary that “Mr. Baker Surgeon Dentist” had arrived at Mount Vernon that afternoon. The dentist stayed several days and charged £5, according to the planter’s accounts. TOMORROW: Who took over John Baker’s practice in Boston?